Studying insects preserved in archaeological context (or paleoentomology) is the specialty of Dr. Eva Panagiotakopulu,Geoscience Lecturer at the University of Edinburgh in Scotland. Eva came to Eagle Nest Canyon recently to see our excavations and get a sense of the potential for finding informative insects in the well-preserved deposits in the rockshelters. Insects dominate the animal kingdom (comprising around 75% of the presently known animal species) and can be particularly informative as they are sensitive to climate, ecology and sometimes human behavior. The beetles (or Coleoptera) are perhaps the most commonly used in archeological contexts and can provide sensitive records of past environmental conditions owing to the fact that many fly, and can readily migrate when conditions change. Most importantly, they can be relatively easily identified from disarticulated fossil insect parts. (More details on paleoentomology in archaeology can be found in Phil Buckland’s An Introduction to Palaeoentomology in Archaeology and The BUGS Database Management System, which can be downloaded at www.bugscep.com/phil/publications/buckland2000_cdpaper.pdf. See also Scott Elias’ 1994 book Quaternary Insects and Their Environments, Smithsonian Institute Press). Looking for bugs in all the RIGHT places! (We hope!) 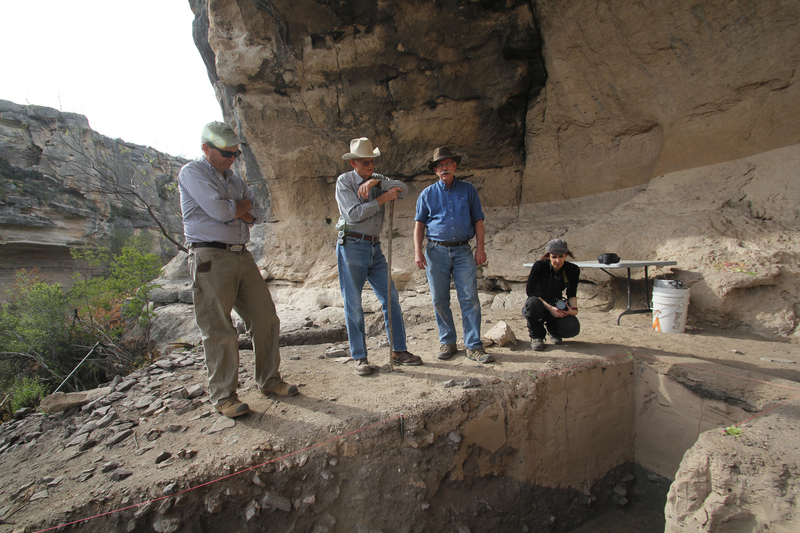 Left to right: Ken Lawrence, Jack Skiles, Steve Black and Eva Panagiotakopulu looking at the Skiles Shelter deposits. Given the excellent preservation for organics in certain ENC rockshelter deposits, we have high hopes that desiccated bugs and bug parts are present (bugs were recovered from the site previously) and can be used to better understand the history and life of the ancient inhabitants of these shelters. Our first step is to send Eva 3-5 liter matrix samples of the <1/2” fraction from several stratigraphic contexts in Eagle Cave. She will sieve and scan fine fractions microscopically. If she strikes pay bug, so to speak, we will expand her study and send her more samples from more contexts in several of our sites. An important part of her work will be compiling identification keys and visiting museums in the USA that have comparative entomological collections, like the one at the Department of Entomology at Texas A&M University (that contains 1.86 million specimens! ), in order to identify the specimens present and obtain information on their habitats. Eva’s trip was probably quite a blur, given she was on the ground here in Texas for 60 hours, about 12 of which were spent driving. Unbeknownst to us before her visit, Eva is a fan of Western History and Judge Roy Bean in particular, and greatly enjoyed visiting the Judge Roy Bean Museum and receiving a signed copy of Jack’s book Judge Roy Bean Country. Before arriving she had no idea she would be visiting Langtry. Between that connection, and the breakfast tacos, brisket, and enchiladas we plied her with, we think the hook was set. Now we wait to learn whether our Eagle Cave matrix samples yield insects. This entry was posted in Archaeoentomology, Spring ENC 2014 Posts. Bookmark the permalink. I hope she hits pay bug indeed! Did Dr. Panagiotakopulu mention any species that may be present in these contexts?